Just as a review, instructors of The Fearless Presentations ® class whole-heartily agree that the first step in designing a quality presentation or PowerPoint deck is to start with a clear and concise title that is audience-focused -- meaning that the title (and the speech) should be focused on what the audience wants, not what the presenter wants to tell them. The second step is to narrow down your key points (bullets) to just three to five of the absolute, most important items that your audience needs to know about the topic. Below are a few tips that will help you design better bullet points in PowerPoint presentations. Once you have your title and your key points, the final step in creating your outline is to make each of your key points really “audience focused.” (See presentation from Hartford Univ.) The very crass, but effective, test that I like to use is the “Do I Give a Flip?” test. Meaning, if you were sitting in the audience, and you saw this title and key points listed on a slide, would you say, “Cool, I can’t wait to hear this,” or would you likely say, “I hope this doesn’t put me to sleep.” If it is the former, then you are on the right track. If it is the latter, you might want to change things around a little. An easy correction that you can make is to look at your bullet points and make sure that what you have written is a complete though or a complete sentence versus just a couple of words. When we just put a couple of words down, it might be a good cheat-note or refresher for us, but the words are not likely to explain to the audience what you are going to cover. Remember that an effective bullet point is a visual aid for your audience, not a “cheat note” for the presenter. 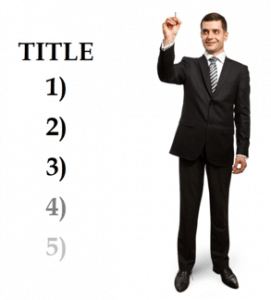 The audience should be able to look at your title and key points and know exactly what you presentation will cover and what your conclusion is. Another good tip related to designing your bullets is to use statements and not questions. For example, if we made the bullet point, “How Do Closing Ratios for New People Compare to Seasoned Sales People?” the audience would be saying, “Well, I don’t know, why are you asking me? I thought you were the expert.” So instead of asking the audience a bullet point, tell them what you are covering. You audience should be able to look at a single slide with your title and three to five well-designed key points and be able to quickly understand what your presentation is about, what concepts that you will cover, and why they really need to listen. So if you want to design better bullet points in your PowerPoint slideshow, focus on the audience, make your bullets into complete statements, and avoid asking questions, and you will find it much easier to deliver your next presentation.